DLI_SNUB-Launcher may be used to select scene files and launch ScreamerNet lwsn to render the selected scenes in ScreamerNet lwsn’s standalone mode (-3) in a few different ways. Before rendering scenes with DLI_SNUB-Launcher, the config file and scenes should first be set up for rendering properly in LightWave3D with a proper Content Directory, image file format and output path as well as the frame render range being set. With DLI_SNUB-Launcher 2 you can now override many of these scene settings at the time of render making the standalone render process that much easier. For more in-depth information about setting up your config files see Config Settings for ScreamerNet and Standalone Rendering with ScreamerNet lwsn Mac from our Mastering LightWave 3D ScreamerNet LWSN white paper. DLI_SNUB-Launcher is a droplet which means that you can simply drag-and-drop LightWave 3D scene files onto the DLI_SNUB-Launcher icon on the desktop or in the Dock/Taskbar, whether it is running or not, to have DLI_SNUB-Launcher launch ScreamerNet lwsn in standalone mode -3 and render the scenes using the custom settings that you’ve set with the DLI SNUB Launcher interface. In addition to dragging-and-dropping scenes onto the DLI_SNUB-Launcher icon on the desktop or dock/taskbar, you may also open scenes to render by clicking on or dragging-and-dropping scenes directly onto the Open Scene for Standalone Render (-3) button as well as selecting the File->Open Scene… menu item when DLI SNUB Launcher is already open and running. You’ll also need to set the proper Content Directory in LightWave Layout so that it is saved in the Config File. If you wish to use any custom settings with the FREE Lite version, you need to launch DLI_SNUB-Launcher first, and set the custom settings in the interface. Then while DLI_SNUB-Launcher is still running, drag the scene to the DLI_SNUB-Launcher icon on the desktop, the icon in the Dock/Taskbar or the Open Scene for Standalone Render (-3) button in the open DLI_SNUB-Launcher window. 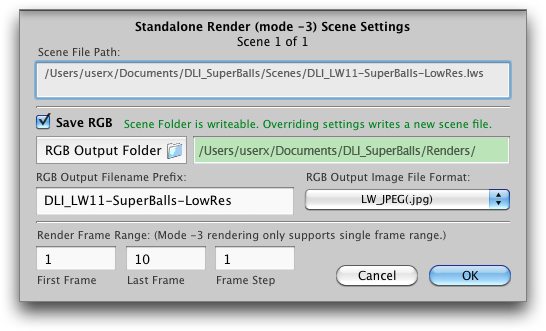 Or you may select the scenes with a file open dialog by clicking the Open Scene for Standalone Render (-3) button or selecting the same menu item. As long as DLI SNUB Launcher is still running it will use your custom settings. Once you quit DLI_SNUB-Launcher, the FREE Lite version will revert all settings other than the ScreamerNet lwsn Path back to the initial defaults. By upgrading to the STD, PRO or ENT version, all such settings are saved from launch to launch. 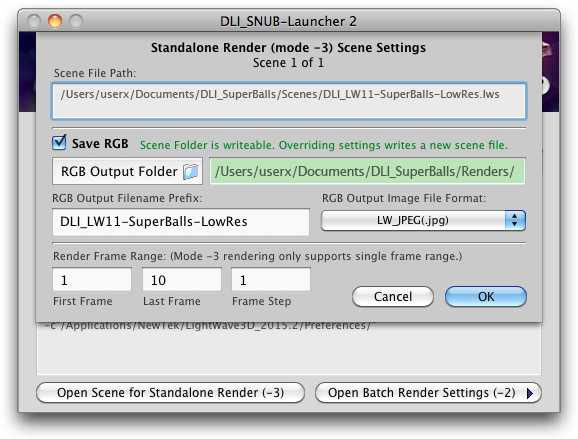 When scenes are opened in DLI_SNUB-Launcher for standalone rendering the Scene Settings panel will open. This panel is divided into three sections. The top informational header section, the middle RGB output section and the bottom frame range section. This panel shows the current settings as saved in the scene and allows the user to override these settings if desired as long as the scene folder is user writable. The top section consists of the scene information header which displays the number of this scene in a possible list of scenes to be opened and rendered in the case of multiple scenes being opened. This information is displayed as “Scene # of #” just below the panel title. Below that is a read-only field that displays the full path to the current scene being opened for rendering. The middle RGB output section of the Scene Settings panel starts with the Save RGB checkmark button and an accompanying text readout. The Save RGB button will be set based on how that setting was saved in the scene file. The text readout will highlight green if the Scene Folder is user writable and red if it is read-only. If the folder is user writable then all the settings in this section will be enabled when the Save RGB button is turned on and the user may override any of the RGB settings. If any are overridden DLI_SNUB-Launcher will write a new temp scene file in the same folder as the original scene with “_DLI_SNUB-Render_” and a number added to the end of the original filename. Click the RGB Output Folder button or drag-and-drop a folder from the desktop to the button or the read-only text field to set the path to the folder where rendered RGB image files should be saved. This field will default to the RGB Output Folder that was set in the scene file from within Layout, if any. The field will automatically highlight green if the folder is user writable and red if it is not. The bottom section of the Scene Settings panel consists of three editable text fields for the render frame range. The fields default to the single frame range that was last set in the scene file. ScreamerNet lwsn renders a single frame range. Any arbitrary ranges that may be set in the scene file will be ignored. You may set this frame range as desired whether the scene folder is user writable or not because the frame range is passed to lwsn as part of the command line, rather thand read from the scene file. The First Frame should be set lower than the Last Frame if the Frame Step is positive. To render the frames in the reverse order set the First Frame higher than the Last Frame and use a negative Frame Step. When done click the OK button to launch lwsn and render the scene or click the Cancel button to discard any changes and cancel the render. When opening a scene for mode -3 rendering DLI_SNUB-Launcher scans the scene’s path to determine what the Content Folder should be set to (based on where objects are found along the path). If this doesn’t match what’s set in DLI_SNUB-Launcher or in the Config File it will warn you about the mismatch and provide the opportunity to change the content folder. Other verifications are performed to make sure that Save RGB is enabled and that the RGB Output Folder is user writable. When opening scenes for standalone rendering, you may select multiple scenes at once. When multiple scenes are selected a separate instance of ScreamerNet lwsn will be launched in Terminal to render each scene concurrently. This may be useful for rendering multiple scenes on multi-core or multi-CPU computers where you set the Config File’s render threads to fewer than the available cores/cpus. For instance, with this method you could render two scenes at the same time on a 12-core (24 thread) Mac Pro with the render threads set to 12 each (using half the available threads each) or you could render 4 scenes with render threads set to 6, etc. In current versions of LightWave3D you could use the built-in render Q panel to sequentially render multiple scenes in LightWave 3D Layout itself but that then ties up LightWave Layout. DLI SNUB Launcher’s multiple scene standalone rendering can still be useful if you need to continue working in Layout while you also render scenes in the background at the same time. For more flexible rendering of multiple scenes use the Scene Queue for batch rendering with the companion DreamLight Constellation network render controller.